Three members assisted crew members conduct telemetry on snowshoe hares and collect vegetation data in the Blackfoot valley over the course of three weekends. All six officers attended the national conference of The Wildlife Society. Officers attended lectures, participated in events and quiz bowl, and shared their activities and vision with other student officers at a student leadership breakfast. Three undergraduate members were given the opportunity to present their summer field work and/or senior thesis projects to members at a Tuesday meeting. Seven members assisted MPG and Raptor View Research Institute band captured bald and golden eagles and observe the capture process. “Be Bear Aware” presentations: A total of 21 members taught children and adults how to be safe in bear country by giving six Be Bear Aware presentations to classrooms, after-school programs, Girl Scouts and at community events. Together, members reached over 131 children and 50 adults. “Wild Jobs” presentations: Nine members shared their past jobs in wildlife and encouraged students towards the biological sciences by giving Wild Jobs presentations to a 5th grade classroom and a high school after-school program. Together, members reached 44 students and three adults. Four members guided an educational hike to Morell Falls for 15 visiting International students from Japan and one adult. Seven members assisted the TWS Montana State Chapter table the two-day MEA-MFT Educator’s Conference. Members encouraged educators to promote wildlife education in their classrooms and take advantage of services offered by both the state and student chapter. Four female officers joined the committee of UM faculty and professionals planning the 2nd annual Expanding Your Horizons conference aimed at encouraging middle school girls toward a career in STEM (science technology engineering and math). 42 TWS members joined forces with Backcountry Horsemen of Missoula and Montana Fish Wildlife and Parks to remove over 3.25 miles of barbed wire fence from Blackfoot Clearwater Wildlife Management Area to prevent wildlife from being injured or killed by getting entangled in the fencing. This is the chapters fourth year participating in the event. Three members spent a total of 37 hours assisting the Be Bear Aware campaign with grant writing, organization, communications and presentation development. 14 members assisted The Great Bear Foundation by gleaning over 200 lbs of fruit from a property recently visited by bears. Six members removed eight garbage bags worth of houndstongue seeds from Missoula lands. The student chapter adopted and purchased gifts for a family of five and one veteran for the holidays. 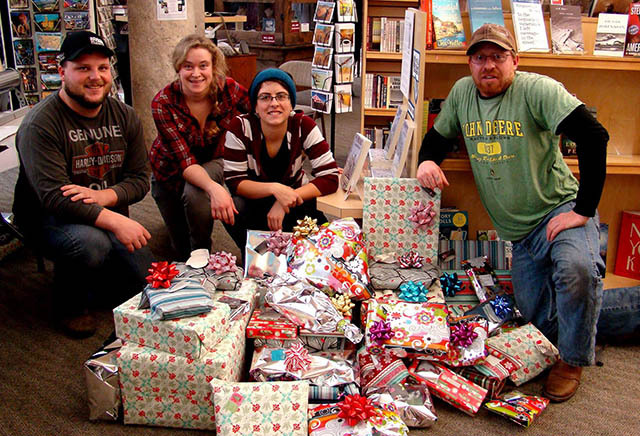 Student chapter of The Wildlife Society members with holiday gifts they donated to a local family and a veteran. 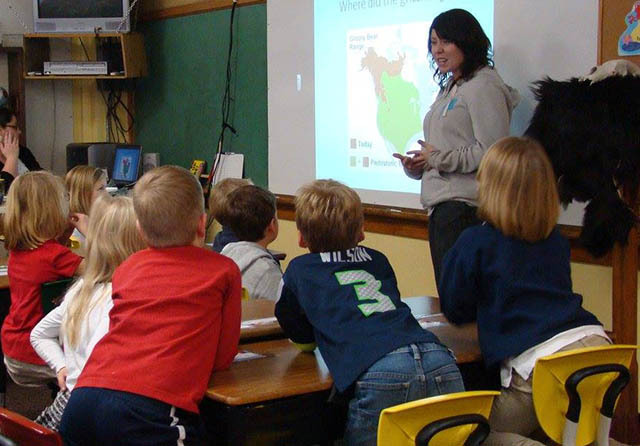 The Wildlife Society officer Jenah Mead making a presentation on grizzly bears to a local first grade class. We meet Tuesdays at 6:00 p.m. in FOR 305.